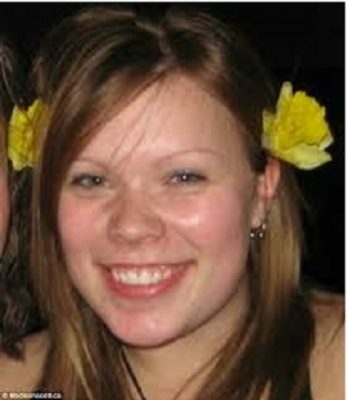 On May 28th 2011 Madison Scott went missing from Hogs back lake near Vanderhoof British Columbia, Canada. She has not been seen since. 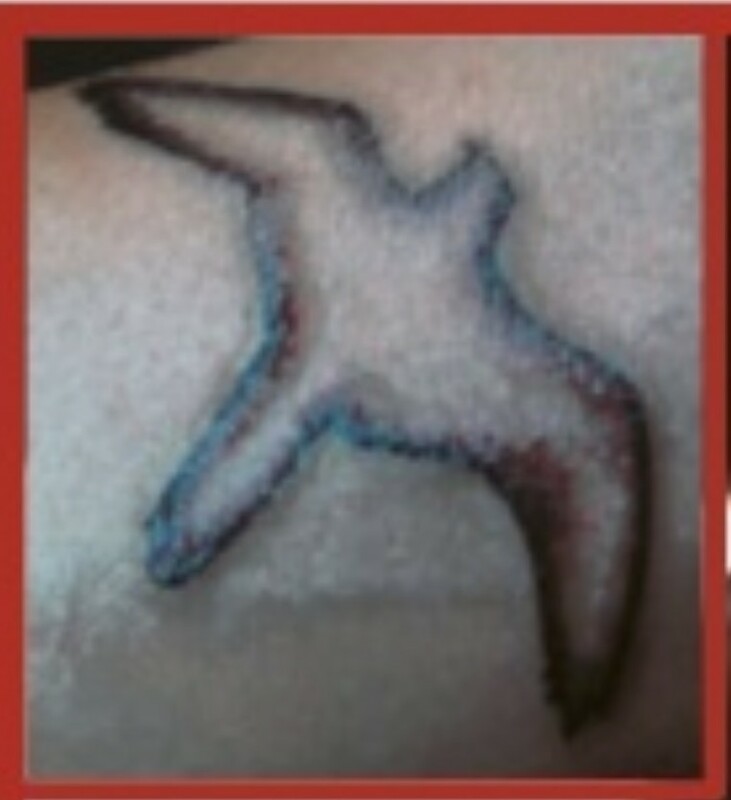 Other: Maddy’s ears and nostril are pierced. This site was set up by the Scott family to spread the word on helping to find Madison Scott, and to provide a central location for information. Feel free to use the contact us page to send us information, or ideas to help find Madison Scott. Let everyone know about http://madisonscott.ca, and the Facebook group. The Time line page explains the events that happened when Madison went missing. Another year has come and went and no Maddy! It will be the 7th year anniversary of when Maddy went missing so…. 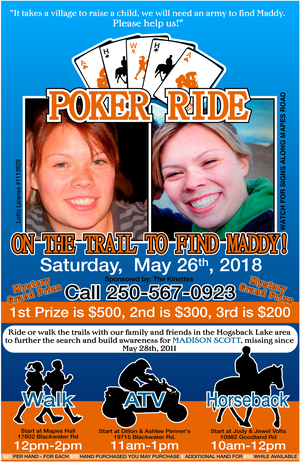 On May 26th come out to the 2018 Maddy Poker Ride starting at or near the Mapes Community hall on the Black water road South East of Vanderhoof, near Hogsback lake where Maddy went missing. Walk, ATV or horse ride on 3 different trails. The cost of the poker hands are 25$. With every 25$ hand purchased you may purchase an additional hand for 10$ while available. Draw cards at the stations along the trails for a chance to win with the best poker hands, $500 for 1st, $300 for 2nd, and $200 for 3rd, and the mystery grand prize. Sponsored by the Vanderhoof Kinettes. 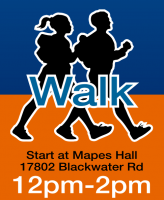 The walking trail starts from the Mapes Community hall, 17802 Blackwater road then heads East on a trail adjacent to the Blackwater road, down the hogs back road then winds through the forest to Hogsback lake then up on a grassy ridge, along a natural meadow, then back to Mapes Hall. If the complete trail is walked it is around 8 kilometres. 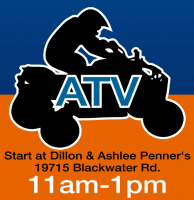 The ATV trail starts at Dillan and Ashlee Penner’s 19715 Blackwater Road. The ATV route heads down the Fox forest service road then heads back on the telegraph trail, by Hogsback lake. The trail is of moderate difficulty and is around 40 kilometres. 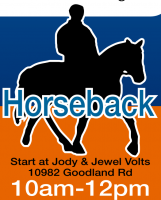 The horse trail starts from Jody and Jewel Volts, 10982 Goodland Road, then passes through Mapes pit up into the Sinkut hills and back. The trail is approximately 22 kilometres long. Scott, 20, had attended a party at Hogsback Lake, a Forest Service campsite about 25 kilometres south of her hometown of Vanderhoof. The night before, a Friday, she had driven there in her white 1990 Ford F150 pick-up truck, pitched her tent and and camped there with a group of new friends from Vanderhoof. They had gathered to celebrate a birthday. But around 4 a.m. the next morning, everyone left but her and she has never been seen since. “We know someone out there knows something about the disappearance. We are asking any individual who has information about Maddy’s disappearance to contact the police or Crimestoppers,” said Cpl. Tom Wamsteeker of the North District RCMP major crime unit. 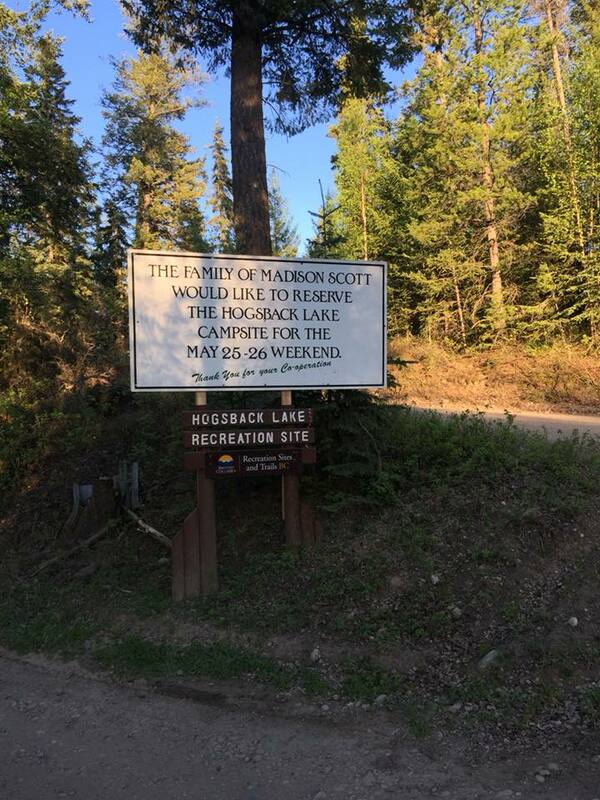 This Saturday, the Scott family and their friends will be holding the a poker ride – On The Trail To Find Maddy – in the Hogsback Lake area. Horseriders start a 10 a.m., ATVers at 11 a.m. and walkers at noon and everyone is welcome to attend. And anyone how may have information that will help solve the mystery is asked to call the Vanderhoof RCMP at (250) 567-2222 or anonymously call CrimeStopers at 1-800-222-TIPS. 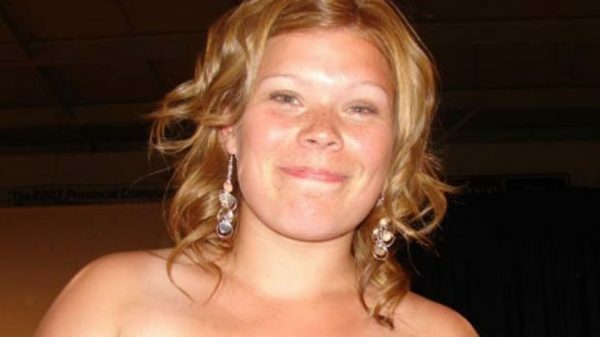 VANDERHOOF – May 28th marks the 7th anniversary of the disappearance of Madison Scott. Scott went missing after an early morning party and despite a massive search by police, family, and members of the community has never been found. 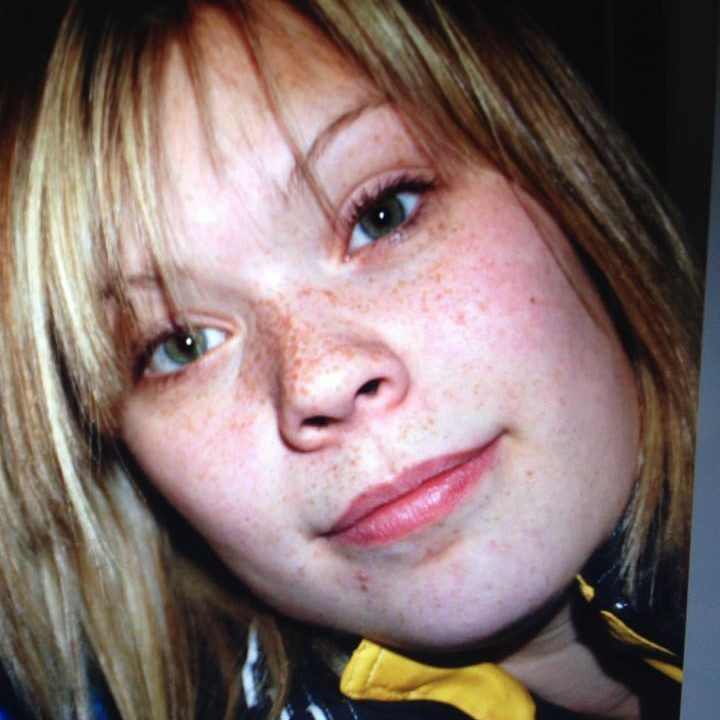 The Vanderhoof teen was last seen at a party on the shores of Hogsback Lake, about 25 kilometres south of Vanderhoof. Her friends left the party around 4:00 am to return home. However, Scott remained behind, apparently planning to spend the night in a tent. When someone came back to check on her around 8:30 am, she was gone and she hasn’t been seen since. Police believe someone in the community knows what happened. “We know someone out there knows something about the disappearance. We are asking any individual who has information about Maddy’s disappearance to contact the police or Crimestoppers” said Cpl. Tom Wamsteeker of the North District Major Crime Unit. Information can be delivered to the Vanderhoof RCMP at (250) 567-2222 or anonymously by calling CrimeStoppers at 1-800-222-TIPS. Meantime the family is holding its 7th annual poker ride Saturday in the Hogsback Lake area, to raise awareness of Madison’s disappearance. 2,195 days and still no Maddy! It is the sixth year anniversary of when 20 year old Maddy went missing from an overnight party at Hogback lake. “We are not here doing the poker ride event to remember her. We are trying to keep spreading awareness that she is still missing, and we need everyone’s help to find her” says Dawn Scott, speaking tearfully like it happened yesterday. This past Saturday, May 27, was an incredibly hot day for the 2017 Maddy Poker Ride. But folks still came out carrying water bottles to walk, ATV or horse ride three different trails in support of the Find Maddy awareness campaign. The number of people who attended this year is believed to be up from previous years. In terms of poker hands sold; there were 105 sold to horse-back riders, 59 walkers and 264 quads. WATCH: Madison Scott vanished on May 28th, 2011 after attending a party at Hogsback Lake, a campsite about 25 kilometres south of Vanderhoof. The last time Madison Scott was seen was May 28 2011. She was 20 years old. Six years have passed, but her parents are still holding onto hope. Crime Stoppers needs your help do you have information that could lead to the whereabouts of Madison Scott? Madison or Maddy as her friends and family call her attended a party at Hogsback lake- about 25 kilometres south of Vanderhoof, which is not far from Highway 16. Although, Maddy would have known the partygoers, a number of people showed up later in the night. Some of the party goers would be known to Maddy and her friends and some would not. While most people had left Hogsback Lake when the party ended, Maddy stayed behind in her tent. 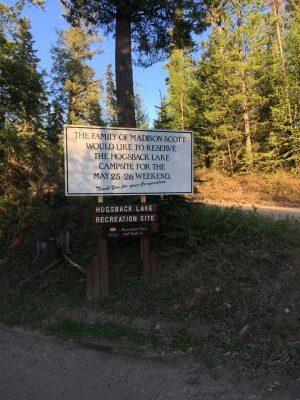 Two days later, on Sunday morning, Maddy’s parents found her tent and off-white 1990 Ford F-150 Pickup truck at the camp site. Her tent had been flattened…her purse left inside the truck. Two items are missing, her keys, which may be on a black gothic theme lanyard and her iPhone. Police believe those items may aid in the investigation. Maddy is close with her family. Her parents describe her as a beautiful, caring and loving person with a great sense of humour. They’ve offered a reward of up to one-hundred thousand dollars for information leading to the arrest and conviction of the person or persons responsible for her disappearance. Investigators believe that someone knows something. They’re asking anyone with information about the disappearance of Madison Scott to call police. Or if you wish to remain anonymous visit bccrimestoppers.com or call 1 800 222- 8477.